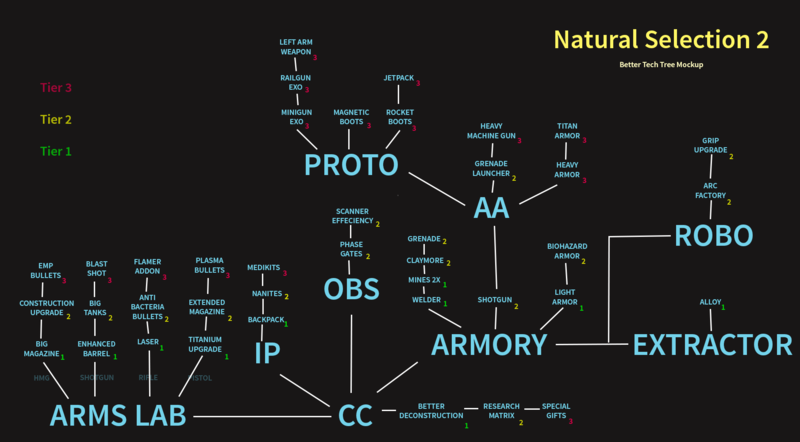 NS2 has a lot to offer on a tactical side, but is very lacking on the strategy side. One reason for this is the marine tech tree. I tried to rebuild it so that 1) There are more choices to make for the commander; 2) There are cost effeciency upgrades; 3) Marines depend more on PRes investments to have power; 4) Having more gear for more interesting fights; 5) Commanders are forced a bit harder to commit to certain tech choices. There is new tech mentioned which I don't explain here, because it doesn't matter. The general tech tree layout is what is important. The tier 3 upgrade for the weapons (except pistol) are an upgrade which gives an alternative fire mode. There are no longer general weapon or armor upgrades. Marine's armor depends on which one you buy and gets lost if you die. There are no longer weapon damage upgrades, instead there are unique weapon upgrades for the four different PVP weapons (some of them do increase damage). This basically removes the mid game 0 PRes 2/2 Rifle marine which can hold off fades. If you want to compete with mid game or late game aliens, you need the appropiate gear for it. The rifle upgrades go more into the support category, so it becomes weaker on the PVP front the more aliens advance in their tech tree and lifeforms. Yes I know, I removed the flamer and put it on the Rifle as an alternate fire mode. You could also leave the flamer as a weapon. The proto has more gear which is very strong and also very fun to play, it is only end game gear. And yes, there is in general a lot more to research than before, which is the point to add strategic choices. Upgrades now also lay on different buildings, so the arms lab is not the all or nothing structure anymore. Some things like turrets or nanoshield / catpacks are not listed here. You can put the dead bodys of slaugtered skulks into it to craft a necklace made of bones from them in base. I would rush Special Gifts every game. "There is new tech mentioned which I don't explain here, because it doesn't matter. The general tech tree layout is what is important." I should just have used terms like "upgrade 1, upgrade 2" and so on if I think about it. The idea was to half the price for weapon drops, but I don't like the idea anymore because I want more dependancy on PRes. If I think about it, I don't think weapon drops even fit into NS2, it seems to be more a relic from NS1 days. Some upgrades that are worth mentioning though are: Scanner effeciency which reduces the scan costs, Alloy which helps extractors somehow (increased Res gain or more HP or lesser build costs or something), Research Matrix which reduces research time. These upgrades belong to a type of upgrades which are commin in RTS games, but nowhere to be found in NS2.